29 DELISLE, G . / BUACHE, Ph. / DEZAUCHE, J. Carte d'Asie Dress�e pour l'instruction. ( Paris, 1819) Limites en col. d'�poque. A good copy. 495 x 635 mm. The map is an updated version of the Delisle-Buache map of 1762. Inset with North-West America, updated. 30 SANSON, N. / MARIETTE, P. Asia Vetus. ( Paris, 1667-90) Limites en col. ancien. Paper contemporarily cut up to plate mark and laid down on a larger sheet of paper. Good and dark impression. 405 x 568 mm. 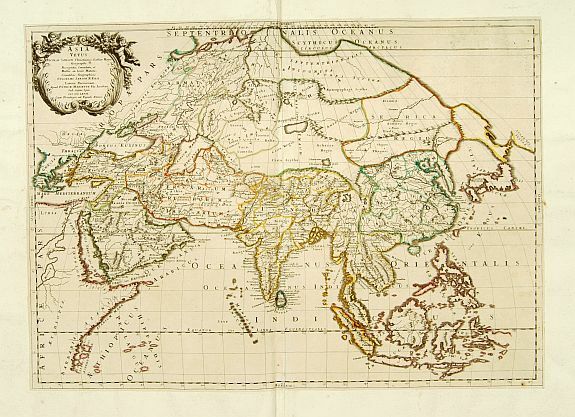 � A fine map of the continent of Asia. This edition carries the date 1667. Nicolas Sanson was to bring about the rise of French cartography, although the fierce competition of the Dutch would last until the end of the century. He owed part of his success to the partnership with the publisher Pierre Mariette. In 1644, the latter had purchased the business of Melchior Tavernier, and helped Sanson with financial support in producing the maps. In 1657 Pierre Marriette died. However his son, also named Pierre, co-published the following years.